Are you an introvert? Being an introvert – a person who prefers calm environments with plenty of independent time – can make finding the perfect job or side hustle challenging. Finding the best jobs for introverts before you apply can save you a lot of personal frustration. Shortly after I graduated college, I started my first job as a copyeditor (which can be a great job for introverts!). I loved the place I worked, the job itself, and my co-workers. But every night the story was the same – I’d arrive back to my apartment completely drained of energy. I’d lie on the couch for at least an hour, and activities I generally enjoyed – like cooking or working out – seemed like an incredible mental burden just because I was so worn out. It wasn’t until I started working from home, doing the exact same job, before my son was born that I put it all together – the work wasn’t wearing me out. It was the open environment, filled with lots of meetings and interruptions. As an introvert, I feel a lot better when I can socialize in short bursts. I concentrate better on my work when I’m not constantly interrupted. I enjoy my family, friends, and hobbies more when I have the mental space to work in a quiet environment. And I really prefer to work on my own. The good news is there are plenty of introvert-friendly jobs and jobs for introverts. And your introversion definitely doesn’t have to hobble your finances or income. You can thrive and make lots of money, even if you’re introverted. Here are the best ways we’ve found for introverts to make money. Reselling for a profit (also known as flipping) is the perfect job for an introvert. Simply put, flipping involves buying or sourcing an item for a low price and then selling it for more. You keep the money you make after the purchase cost – your profit. This side hustle doesn’t have to require a lot of personal interaction. You can source your items and then listing them online from your smartphone or computer. Reselling, just one of the ways introverts can make money, relies heavily on researching prices and selling volume – and research is a skill that introverts are typically great at. Interested in reselling items for cash? Check out my list of the 50 easiest things to flip for profit or my guide to getting started reselling shoes online. Another super-useful resource for newbies to reselling is Flea Market Flipper University by Rob and Melissa Stephenson. 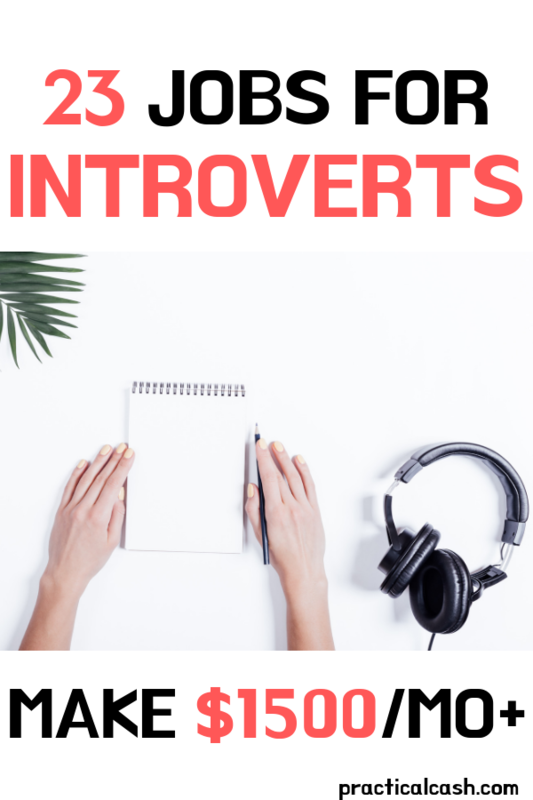 It’s an awesome course jam-packed with all of the info you need on starting this introvert-friendly side hustle. If you want a step-by-step guide to reselling, complete with videos showing you exactly what to do, check it out. Making money by selling online is easier than ever. Today there are more platforms to sell on, more money making apps to use to price and sell your items, and more places to purchase items to flip. Last year, I made over $5,000 per month flipping items for money. I’d say it’s the perfect job for an introvert. If you have great English and grammar skills, proofreading and editing can be a great career for an introvert. Businesses, bloggers, and online marketers depend on proofreaders to make their content easy to read and helpful to their audiences. If you’re an introvert, you may find that focusing on written communication suits you well. If you’re detail oriented and learn just a few basics about how to get proofreading and editing jobs, this introvert-friendly job could be right for you. To get started, check out this Free Webinar about the skills you need to start your freelance proofreading side hustle. This informative online course will give you the exact steps you need to start home based jobs proofreading for blogs or websites. Click Here to Access Your Free Proofreading Webinar. 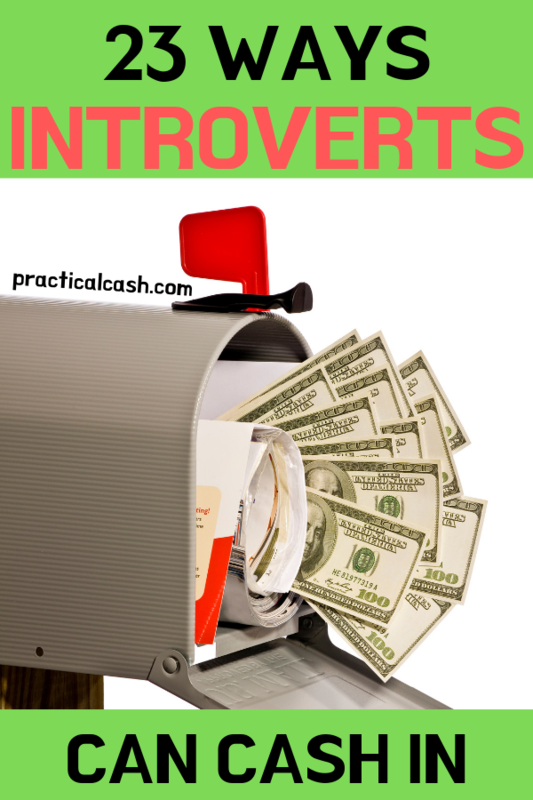 If you want to add an extra income stream to your introvert life, look into taking some surveys for cash. Companies need customer opinions on their products and services, and they’re willing to pay you to help them out. It’s one of our favorite ways for introverts to make money. The amount you earn taking surveys varies (you could make anywhere for $10 to $500 a month, depending how much you work at it) but it’s awesome for introverts because 1) you can easily do the work from home or on your own schedule and 2) it doesn’t require any face-to-face interaction. Check out this list of some of the best free survey sites to get you started. Introverts are often skilled teachers because we love connecting and helping people. Another avenue for making money as an introvert and one of the best jobs for introverts is to tutor kids online. One of the best companies I’ve found for online tutoring is VIPKid. VIPKid is an online English education platform that connects children who want to learn to speak English with English-speaking instructors. If you choose to tutor children with VIPKid, you’ll use the company’s provided curriculum to deliver English classes online from the comfort of your home. You can set your own schedule and work as many or as few hours as you like (perfect for introverts!). For more information about teaching English online with VIPKid, check it out here. Starting a blog can be another way for introverts to make money. If you love writing, creating content, and connecting readers with solutions to their problems – consider starting a blog. Blogs offer a creativity outlet and way to make money without requiring a lot of face-to-face interaction. You never even have to promote your blog in person at all! If you’re an introvert who’s into homeschooling and parenting, starting a blog can bring you interaction and profit without interfering with your family time. Love gardening or cars? Share your expertise by starting your own blog. How do blogs make money? There are a lot of ways introverts can make money with their blogs. Display ads on your blog (advertisers will pay you for page views or clicks). Promote other products you sell, like printable worksheets or books or memberships. Market other people’s products and receive a cut of any sales (this is called affiliate marketing). Drive traffic to a Youtube channel or other place where you sell products. The amount of income an introvert can earn is inspiring! Recently I put together a list of 50+ Blogger Income Reports – reading through the monthly income that popular bloggers have shared always fires me up. If you’re getting started with a blog, check out my article How to Get Started Blogging for Money to learn about the process and where to go to get started. Do you believe you have to be extremely extroverted to have a Youtube channel? Not so! As long as you’re willing to create content that resonates with viewers, you can start a Youtube side hustle even if you’re an introvert. Do you have a special skill that you can teach others? Do you want to film your daily adventures or share your special collection? There are even youtube channels that don’t even show their creators – just their hands or their voices. To create your own Youtube channel, check out Creator Academy. If you have graphic design skills, consider starting a side hustle designing physical products, like T-shirts, coffee mugs, and tote bags. This strategy suits itself well to the introvert personality, since the work is uploaded online – and orders are fulfilled through third parties. You never have to sell your wares in person, which could be really draining for an introvert. Learn how to get started selling physical products online here. Lots of introverts relate better to pets than they do to people, so caring for pets is one of the best jobs for introverts. If that’s the case for you, you could earn money by boarding, grooming, and exercising pets using the Rover app. Rover is an app that matches animal lovers with pet owners who need sitting and walking services for their animals. Pet owners book your boarding services and pay right through the app. You can sign up for animal boarding services with Rover here. Introverts tend to be calm, good listeners, which makes them perfect for helping customers of companies with their problems. Many businesses now utilize online chat support or phone customer support, and many of these jobs can be done from the comfort of your own home office. Another side hustle perfect for introverts is renting out your car with the website Turo. With the free Turo app, you simply upload photos of your car and note its availability. Customers can then book your vehicle and you earn cash. Turo is perfect for introverts who want to earn some extra money but don’t want to do a high-interaction hustle like sales. Introverts who enjoy cleaning will enjoy the flexibility and freedom of owning a housekeeping business. Typically, you’ll be caring for people’s homes or offices while they’re at work during the day – so you won’t have to endure lengthy periods of face-to-face interaction. Are you an introvert interested in starting a residential or commercial cleaning business? Check out How to Start a Cleaning Business with No Money. Working outdoors as a landscaper might be the perfect introvert business for you. Though you’ll need a strong back, landscape design skills, and general business knowledge about marketing, advertising, and accounting, you won’t be stuck in an office cubicle next to someone who talks loudly all week long. The fresh air and freedom of owning a landscape business might fit the bill as the perfect way to make money for some introverts. Writing books – whether nonfiction or fiction – is another extra income idea for introverts. If you like writing, you can create, produce, and publish your works online – and never have to set foot in an office. Lots of introverts are excellent at deep, focused concentration, the type of work that writing a full-length book requires. Amazon’s Kindle Direct Publishing platform allows you to format and upload your own creations in the form of a digital ebook. Amazon will pay you residual income royalties every time a customer purchases your ebook in this passive income idea. You can also sell your ebooks on Barnes & Noble, the Apple Store, and the Google Play store. There’s no limit to the number of ebooks you can upload, so you can create a significant side hustle income stream from writing ebooks as an introvert. Introverts with acting skills and theater experience should look into narrating audiobooks for Amazon’s Creator Exchange (ACX) program. You’ll need your own equipment and editing software, but Amazon will pay you royalties on sales made for books you narrate. And, if you are the creator of a print or ebook, you can upload a narrated version of your book here as well. Find out more about the ACX program here. You can start a passive income stream today by renting a room or space in your house. You can even rent your parking space, your garage, or your backyard. Getting a roommate or two helps cover your rent or mortgage, while you earn residual income streams. Thanks to AirBNB, it’s easy to rent out the space you have available, from homes to rooms, even if you just want to rent them out for a few nights a month. The AirBNB app lets you as the owner vet guests and take payment. You’ll be rated by guests, too, so you’ll have to be sure your rental is clean and you communicate well with guests over concerns and issues. Get more info about ways to make passive income renting out space with AirBNB here. Search engine companies want insights into how users are using their search engine to find information on the Internet. That’s where search engine evaluators come in. As a search engine evaluator, you’d be checking to make sure that searches bring up valuable, timely, and comprehensive information. In most cases, doing work as a search engine evaluator means you’d be an independent contractor, not an employee. To get started with this income stream, you’ll have to apply to the companies and go through their testing process. Most of the companies listed above hire people as independent contractors. Pay schedules vary, but are typically on a weekly or monthly basis. Create your own products to sell in your online store. Sell products you order from a wholesale supplier and ship to customers. Dropship products (send directly from wholesaler to customers). Making money from an ecommerce store requires focused effort on advertising, driving online web traffic, and product management – skills that introverts are likely to excel at. Attorneys who are preparing to present their case may use the services of a mock jury or online jurors to get feedback, watch videos, and answer questions. They may pay a fee for the time of people who offer online juror services. This service has the potential to be one of the best jobs for introverts as it’s all done online. You can sign up to be an online juror with companies like eJury.com, JuryTalk.com, and OnlineVerdict.com. Even if you are more introverted socially, you can still earn great money managing social media for businesses. In this made-for-introverts job, a typical day might involve writing social media updates, editing video or photo content, and scheduling future social media posts. You might also respond to comments made on a company’s website or social media channels. Do you enjoy finding a solution to a problem? Computer programming and coding offers a lot of benefits and could be one of the best jobs for introverts. Computer programmers and coders often work independently to make software and websites. It’s a career that requires a lot of detail work – a skill that introverts often at excel at. And a lot of programming jobs allow work from home, so you can make the environment around you as introvert-friendly as possible. Even if you don’t have degree in computer science, you can get started as a programmer or coder. Look into coding bootcamps like FullStack Academy or Bloc. You’ll need to create an online portfolio of your work before you start your introvert job search. Transcription is another awesome opportunity for introverts to make money and one of the best jobs for introverts. You don’t need a ton of equipment or experience for these jobs. Some companies (such as Amazon’s MTurk) that use freelance transcriptionists offer daily payouts. For more information about getting started as a transcriptionist, the best resource I’ve found is here: 19 Transcription Jobs Online for Beginners. Whether you’re delivering groceries or takeout, delivery jobs involve brief bursts of interaction – and lots of time to work on your own, factors that make this a great side hustle for introverts. Companies that hire delivery drivers include DoorDash, Instacart, and Amazon Flex. If you’re experienced in your career but need more freedom than a 9-5 office environment provides, introverts have the option of going freelance or consulting. As a freelancer, you’re essentially running your own business, so in most cases you’d need to pay self-employment taxes, health insurance, and other office costs on your own. However, if you’re freelancing or consulting, you can usually work from home in an environment that suits your introvert lifestyle. This can make it a great option for introverts who need structure and less face-to-face interaction in their working day. 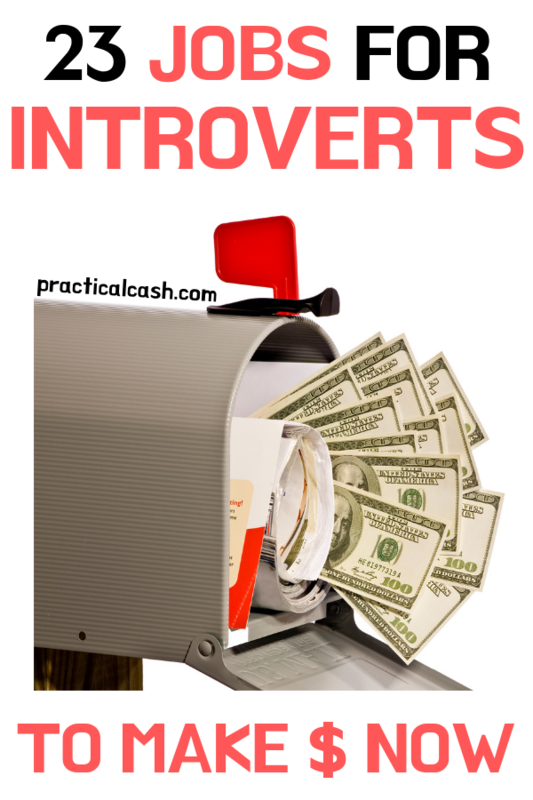 What are your favorite ways introverts can make money? What do you think are the best jobs for introverts? Let us know in the comments!